Just about a year ago, we were introduced to the fabled RED RANSBURG. It was included in the CAAF Dream Halloween event of 2007 where this CAR along with the “blue” Ransburg & 69 other CARS were part of a one-of-a-kind CARS display case as part of the benefit auction. The winning bid of $13,000 was placed by the CEO of TRU. 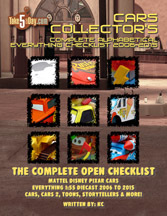 This case of course included may CARS released in 2008 but also a few that still has not seen a release – making the set – rare on many levels. Of course, the two rare gems of this display set at that time was the “red” Ransburg & “blue” Ransburg. (Ransburg is a electrostat-paint process of allowing chrome colors to “adhere” to metals but you knew that 🙂 ). These were the first official non-canon CARS not to be offered to the public. * Non-canon in the sense that they are not accurate if you use the CARS movie as the basis of all that is holy and sanctioned as righteous. (Technically, the only non-canon CAR in release was Rollin’ Bowlin’ Mater). *Surprising, a few weeks later, Disney & Mattel announced the Blu-Ray DVD promotions. 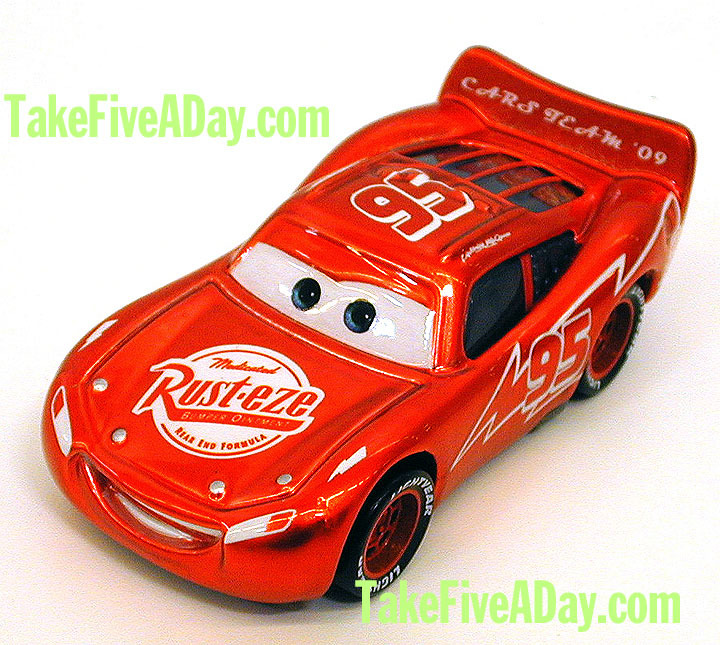 Buy a Blu-Ray DVD, send in $3.79 and receive a “free” Blu (Ransburg) Lightning McQueen. Some grumbled that it was non-canon but the reception and interest was mostly welcoming and it was a huge success. 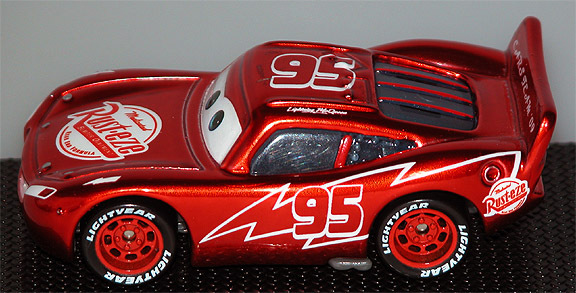 Ultimately, there were some fulfillment issues but that’s a minor footnote in the history of Blu Lightning McQueen (as he is officially called). Blu Lightning McQueen’s production was pegged at 15,000. 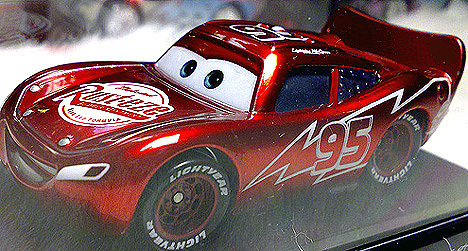 But the production of Red Ransburg Lightning McQueen is officially ONE – he is THE ONE. However, from the actual production time of Red Ransburg ONE to its public appearance in October 2007 – there was a second Red Ransburg crafted. It was an internal CAR only. Along with other promotional and gift items, it was given out at a brainstorm session attended by Mattel/Disney & Pixar CARS diecast personnel in Fall of 2007. There were 50 given out in a bag along with t-shirts. This is commonly called the Cars Team ’09 Red Ransburg or the “Brainstorm Team ’09” Red Ransburg. These are photos of a REAL and AUTHENTICATED Brainstorm Team ’09 Red Ransburg – (not mine, BTW) as you can see – there are some slight differences between this one and THE ONE. Some of the color differences can be attributed to different lightning conditions but of course, there is a CARS TEAM ’09 on the back spoiler and the “headlamps” tampo decals are different. Interestingly enough, in this day and age, no AUTHENTIC or REAL Brainstorm Team ’09 Red Ransburg has ever turned up on the secondary market. Normally, this would be essentially the end of the story. Sure, some customizers could sort of replicate the ransburg paint process and create you a reasonable facsimile of either of the two CARS. And while Mattel doesn’t encourage customizers, they appreciate that you have rightfully purchased one of their products and you are creating a new piece of art with it. Most customizers who successfully sell their wares on ebay or elsewhere really can be artists. However, with the massive success of the Mattel Disney Pixar CARS line, a new wrinkle has been added to the mix. EARLY RUN VERSIONS – it takes a while to get everything fully up to speed. 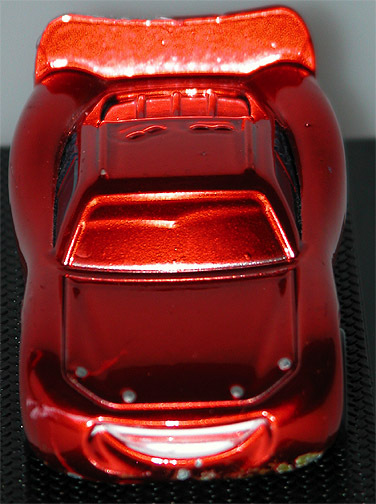 In the case of diecast cars (& CARS), they inject liquidy metal (mostly zinc) into molds and of course, the early ones might need tweaking, etc, etc … generally they get re-cycled but as they begin to approach final phase stage – some early ones might get slipped by into a bin somewhere … and prior to the last few years, this was the source of most of the “unauthorized” ones – people would slip a few by and get them painted later or in some cases, sold as early prototypes or early production un-finished versions. BACK DOOR EARLY VERSIONS – Of course, as old as time, the back door versions that were completed, packaged and even boxed – what factory hasn’t lost a few things out the back door (okay, I guess maybe a tank or an F-18 factory 🙂 ). EXTRA PRODUCTION – While a client such as Mattel pays for 10,000 of something, they might have a little left over to crank out another 10 or 50 that they sell elsewhere – depending on how big the object is. 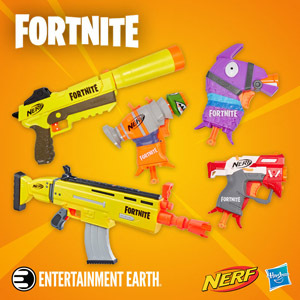 For toys, it was really never that huge of a deal – toys generally are popular in one specific region and since in the past 30-40 years, most US toys have been manufactured in Japan, Taiwan, Thailand, Hong Kong and now China but until the last few years, frankly, there wasn’t much of a ‘back door’ market. Yea, you could take it to the outdoor markets of Hong Kong and while a Ferrari diecast might garner interest everywhere, how much could make off a early production Nolan Ryan in Hong Kong? Or even that Ferrari – since HK was awash in back door versions, maybe you could make a couple extra bucks but it wasn’t much of anything. Of course, that all changed with eBay. Suddenly, that unpainted Nolan Ryan that was worth $3 dollars in Hong Kong is worth $200 USD to some guy in Texas … but of course, there was still limited interest & financial return since while the factory is full of toys, what was actually worth the effort to make money? If you don’t have the card that says TREASURE HUNT, in a factory with 500 different cars & 12,000 diecasts overall – good luck picking out the T-Hunt without a cheat sheet. 99% of the diecasts are worth about $1 or $2 – not exactly a worthwhile return even if you acquire the diecast for free. 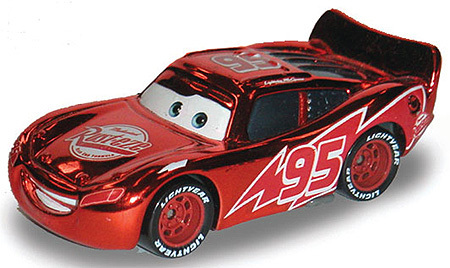 Enter Mattel Disney Pixar diecast CARS. For the first time EVER, every car that rolled off the production was worth anywhere from $10 to $50! You didn’t have to guess which was the Treasure Hunt and unlike a HW Treasure Hunt, where you needed the car on a card for it to be worthwhile … no such problem with CARS. As long as it was out before it hit the US market, EVERY car was worth $10 to $50 and as they later discovered, some upwards of $200 dollars EACH! Of course, every factory actually has security so there is a limit to what is ultimately available even by the back door method … because if Mattel orders 20,000 of a CAR, it pays for enough material to make not many more than that (as mentioned, there is always a 5-10% leeway for early production ones where the mold is not quite hot enough or the paint is not flowing correctly etc, etc … the normal part of business). But a factory is not going to idlely stand by while you run off with a couple hundred of the cars since they’re paying for that material and have to make up any shortfall OR of more importance, who wants to explain to a client like Mattel why there is a leakage – would you rather make an extra $1,000 or lose the contract to make 100-million cars? 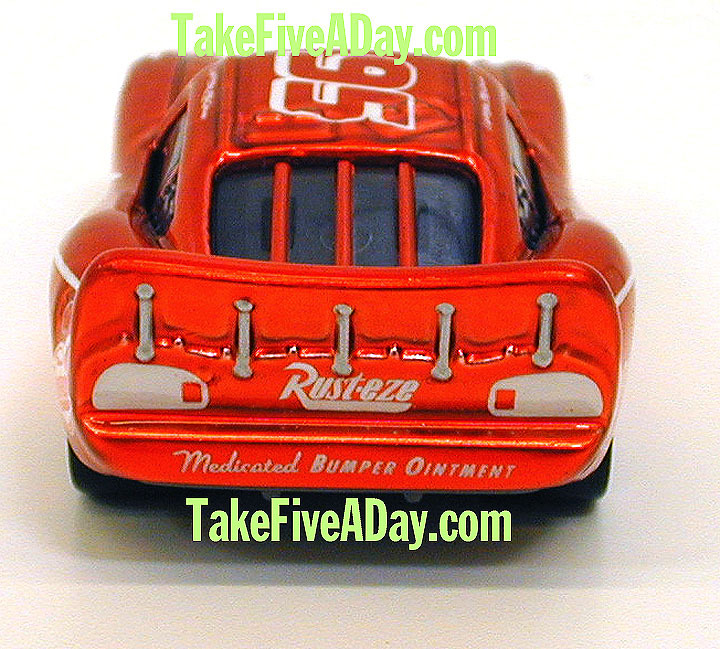 So, while grabbing 5-10 of each CAR was a nice sideline business … they soon realized they had bigger fish to fry … first it was this Red Ransburg car in which people were willingly paying from $50 to $800 for! And later, the Speedway of the South set … that people were willing to pay close to a thousands to get an early set. When you start waving that kind of money around, people tend to get serious. It is what is states – that the very factory that produced the AUTHORIZED CARS that Mattel pays for and approves and then sells to us … is also working a second/secret shift to produce non-Mattel non-authorized CARS lead by a group of people with more personal interests. They basically cranked up the assembly line to make their own versions. So, no more hand painted production rejects, no smash & grab, no three finger deals back at the loading dock. It’s enough to make your head spin. Look, I could splinter this off to a long discussion on legality, ethics, yaddi, yaddi, yaddi but I don’t think I’m going to change anyone’s mind, belief or interest in this whole situation. I’m just going to present the facts and you decide what you to do. I’m not here to judge you or anyone else. I’m just going to present the facts and if you’re still interested, you decide what you think it’s worth or NOT worth. You’re an adult – hopefully and will make the right decision for yourself. In other words, you can wrestle your own conscience. Some guy who is a slightly vastly better writer than me wrote this great short story once upon a time 🙂 . 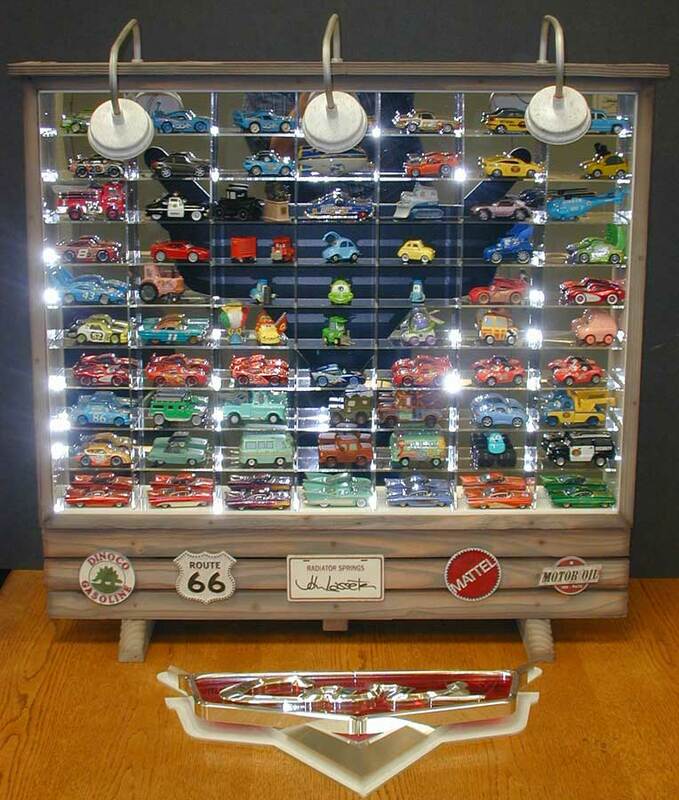 Literally, the one in this world – comes with 69 other CARS in a one-of-a-kind signed display case. One of 50 given away at an internal event. Some differences to note: Spectraflame Red Orange, white “headlamps,” painted hood “bolts,” and of course, words on back spoiler. The next on the list – all unauthorized versions. Originally “sold” with the story as part of another Mattel meeting giveaway but now simply classified as all unauthorized (no such meeting or official giveaway). It appears to be the merger of the first two CARS along with extra piping around the hood. The typeface on the back spoiler is larger & different than the BRAINSTORM 50. This batch also appears to have no date code at the bottom. Created to appear the same as the original one-of-a-kind THE ONE Red Ransburg but essentially the same as FACTORY UNAUTH #1 except without the words on the spoiler. This batch seems to have no date code on the bottom. Virtually identical to the BRAINSTORM 50 except more Ransburg Red than Spectraflame orange-red and with a date code ending in XXX8 indicating it was made in 2008 – unlike the BRAINSTORM 50 which was given out in 2007. I also believe these are a slightly brighter red than FACTORY UNAUTH #1 & FACTORY UNAUTH #2. So, that should sum up the situation to today. It seems that Mattel has plugged up the production leak so it appears unlikely we will see any more of these factory unauthorized CARS anymore. But there should still be @650 of these factory unauthorized Red Ransburg floating around out there – just so you are clear in what you’re getting. Unless you get proof positive, you are getting one of the BRAINSTORM 50 Red Ransburg, any of the others being offered is one of the factory unauthorized versions – its value and your interest is entirely up to you to decide. I should also note that none of the photographs of various versions of the Red Ransburg shown are mine – these photos are all supplied by others – thanks for all the help in piecing the spy life of Red Ransburg. I hope this clears up all the questions as I grow weary of the whole Red Ransburg situation and hope they just include one in every box of Frosted Flakes 🙂 . The security car in the case looks way too small to be richard or marco. I am sure the deluxe ones i have are bigger. Does anyone know where this case sits now? Man, I still covet the CAAF display case.